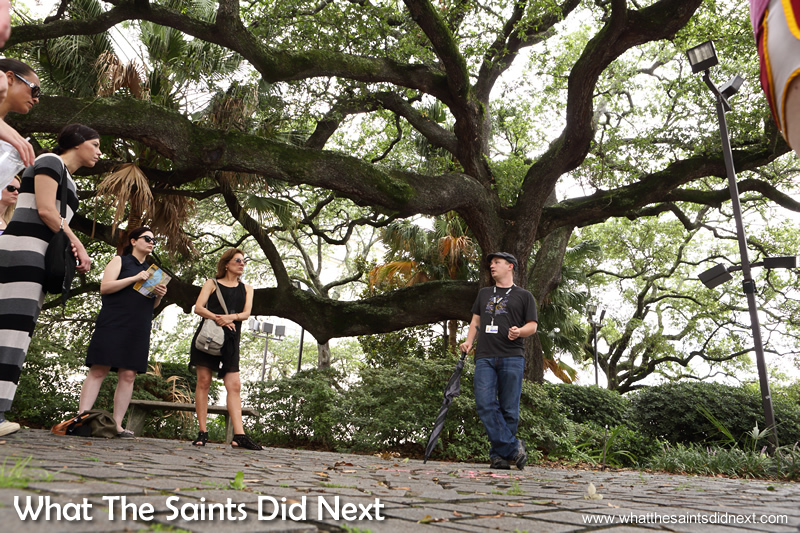 Voodoo in New Orleans is a popular subject as demonstrated by our large walking tour group with Free Tours By Foot. We’re off on a free walking tour in the French Quarter to learn about the Papa Legba ritual, gris gris bags, money spells that work and other Voodoo magic. What is Voodoo And Is Voodoo Real? Here to set the record straight about our Voodoo misperceptions is James McWilliams, a New Orleans historian and tour guide. James begins by informing us, Voodoo is a religion (I did not know that), and he is a practicing Voodoo follower. 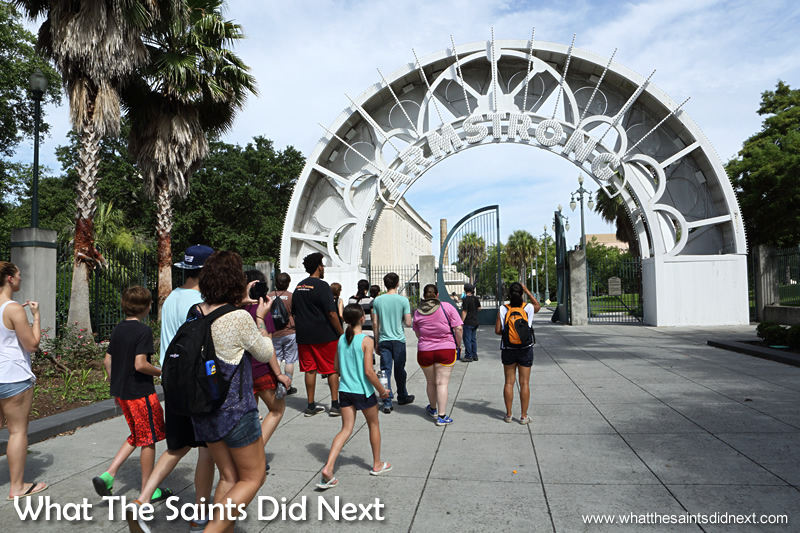 We’re gathered on Rampart Street, opposite the Louis Armstrong Park for a Free Tours By Foot New Orleans Voodoo tour with James a Voodoo practitioner. The air is already ‘soupy’ even though it’s just mid-morning; sweat is running off in beads. The Voodoo in New Orleans tour party heading into the Louis Armstrong Park. Voodoo in New Orleans is a huge part of the city’s culture and there are Voodoo references everywhere. The city embraces its iconic reputation for the mystical, Voodoo dolls and paraphernalia can be bought on any street corner. There are New Orleans Voodoo shops everywhere. NOLA has a population of 400,000 of which around 4,000 (1%) practice Voodoo. The origins of the Louisiana Voodoo religion began in the early 1700s, brought across the Atlantic through the West African Slave Trade from countries like Benin, Togo and Nigeria. It was originally called the Vodun religion. Back then the city was enclosed by a rampart, a wall (hence the street name) designed to protect its dwellers from bandits, pirates and Indians. Behind the wall (what is now Louis Armstrong Park) was nothing but wilderness, swamps and bayous. 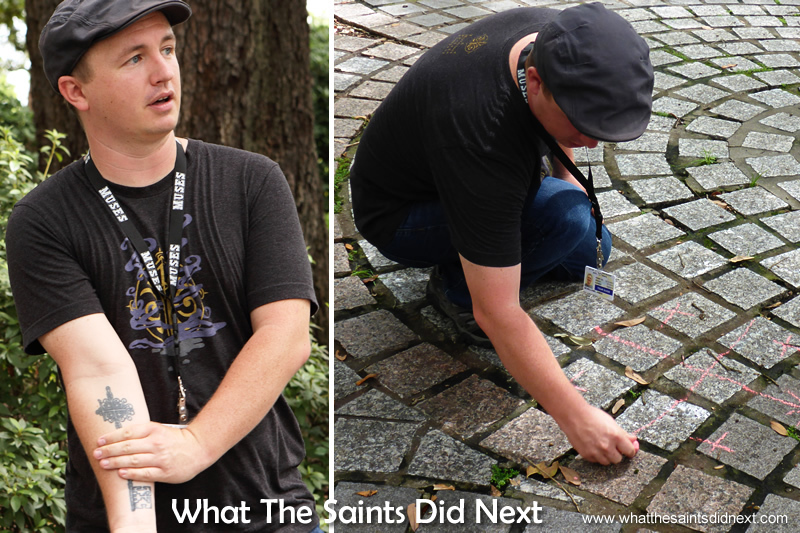 James drawing a Papa Legba veve in chalk in Congo Square and showing us his skeleton key tattoo topped with a Papa Legba veve. Voodoo in New Orleans. NOLA was under French rule and the slave population were governed by Code Noir, the Black Code, a decree listing amongst other things that all slaves be Roman Catholic and attend church. Consequently, it was illegal even for slaves to work on Sundays. Church services did not last all day and slaves naturally met afterwards for social gatherings. Slaves far outnumbered whites and their large gatherings made the French uneasy. A ruling was introduced making it illegal for groups of three or more slaves to form inside the city limits. Outside was fine. Where Does Voodoo Come From? So it began. After church services slaves climbed the wall and on the outskirts of the city limits celebrated their fleeting moments of freedom, singing and dancing. It gave the African slave population in New Orleans the opportunity other colonies in the US didn’t have; to hold on to their culture as best they could. And practice their religion in secret. A Congo Square sculpture captures the moment so vividly you can almost hear the drumbeat. The spiritual practices and Voodoo beliefs of those enslaved people from Africa and the Caribbean blended. So African Voodoo, Benin Voodoo in particular and Haitian Voodoo, became a fusion that also incorporated Catholicism. Voodoo origins line in West African Vodun. 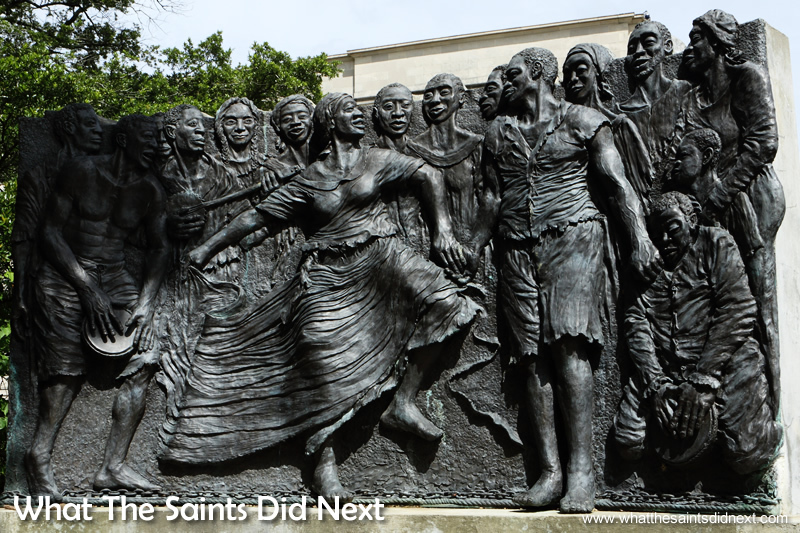 This Congo Square sculpture depicts slave’s 17th century Sunday celebrations. These laid the foundation of NOLA’s unique musical traditions including jazz. 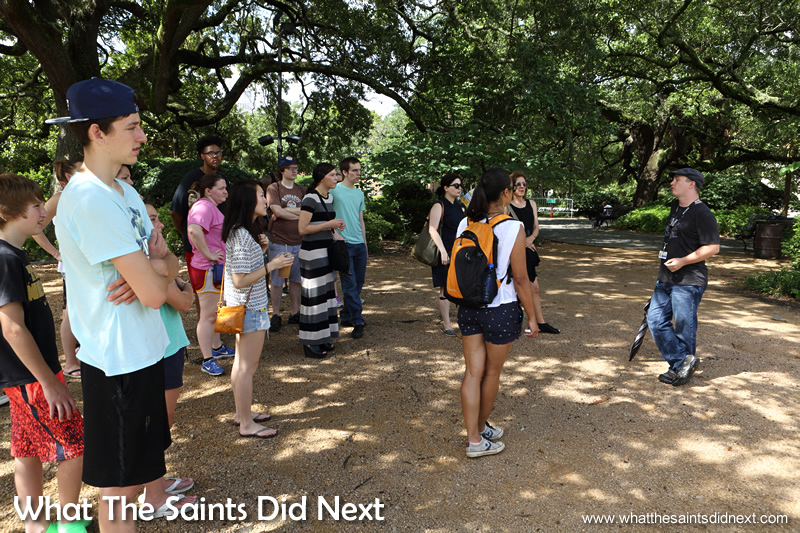 Learning about the New Orleans religion, standing under the shade of trees in Congo Square, the place where Voodoo began. A metal plate in the park marks the spot of an oak tree stump where Voodoo rituals took place, a pink rose rests on top. Conscious we don’t melt we’re ushered under trees for relief, “it’s always 10 degrees cooler in the shade, like turning on the AC,” says James. It’s true, it works. Louisiana Voodoo is an oral religion, whereby there are no formal Voodoo books or bibles because it stemmed from people who were illiterate. Instead Voodoo practices and traditions have been verbally passed down over time. Perhaps this explains its mystery and vulnerability to exploitation. James tells us that in the Voodoo religion there is only one god, one Supreme Being who created the universe. This god elevated earthly beings to Voodoo spirits known as the Lwa or Loa (pronounced lo-ah) to run the day to day affairs of the world. They took charge of nature and human nature. There is for instance loa of the winds, love and fisherman. 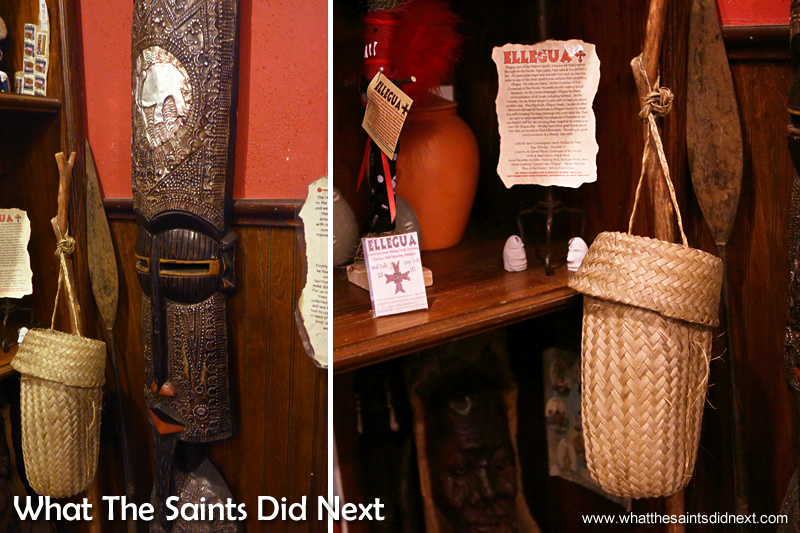 Papa Legba’s walking stick in ‘Voodoo Authentica.’ Voodoo in New Orleans. Voodoo rituals are performed by the Voodoo Queen and Voodoo Doctor and started by ‘calling the spirit down’ of Papa Legba; loa of the crossroads between the spirit world and earth. Using handfuls of cornmeal a drawing of Papa Legba’s veve, (pronounced vay-vay), one of the Voodoo symbols would be sprinkled on the ground. Gifts of rum, tobacco or sweets are then offered to the spirit of Papa Legba. Now this is where it gets hairy. The spirit of Papa Legba samples then offerings via spiritual possession. He tends to be an old man with a walking stick. That walking stick has a bag tied at the top of it which is said to contain the fate and destiny of ever mortal soul on the planet. “I know on TV every time the Voodoo spirit shows up it’s always; I want immortality, I want you to curse my enemies, kill that person. Again, it’s just not the way it works. I can prove that as a historian,” says James. “If we could have killed our enemies don’t you think slavery would have ended before 1865?” That’s a good point. 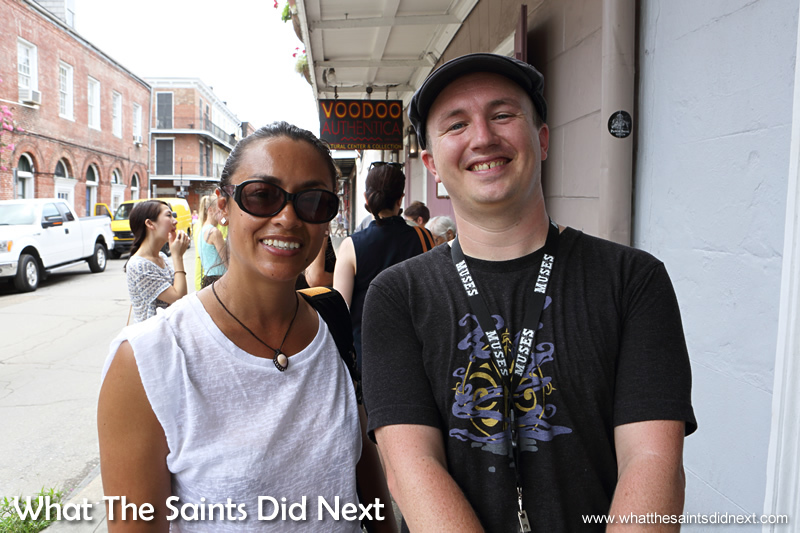 Our free walking tour then moves into the heart of The French Quarter and the legend of Marie Laveau, the New Orleans Voodoo Queen of. She emerged in the mid 1800’s and singlehandedly, “popularised, legitimised and commercialised” the Voodoo religion James tells us, and brought it out of the underground. 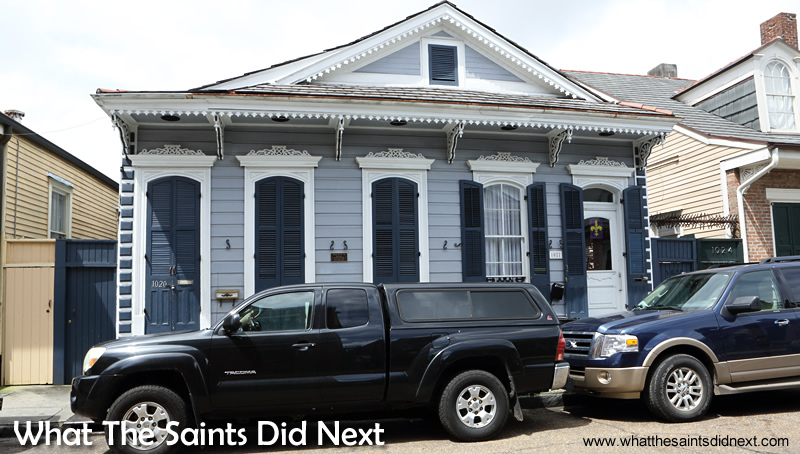 The Marie Laveau House of Voodoo was where this blue building on 1020/1022 Rue (street) St Ann stands. The actual house Marie Laveau Voodoo Queen of NOLA, lived in was demolished in the early 20th century. It would have resembled the brick building next door. Marie Laveau was the illegitimate child of a mixed raced mother and a white plantation owner. She became a sought after hairdresser and trained as a Voodoo priestess in Congo Square. Madam Laveau lived at 1020/1022 Rue St Ann although her actual house has been demolished. 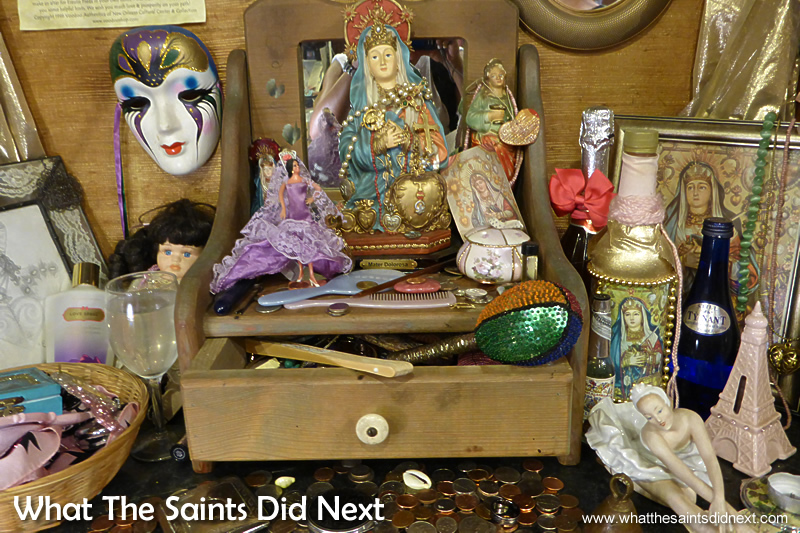 As an uncannily accurate fortune teller and Voodoo Queen she became one of the most influential figures in Louisiana. “I think she is the most fascinating woman in our history, she’s also one of the most mysterious and it’s hard to separate fact from fiction,” says James. Born between 1794 and 1801 as a free woman, Marie was the illegitimate child of a mixed raced mother and a white plantation owner. She became a sought after hairdresser and through this, picked up gossip and information, “at the highest level of New Orleans society.” She set up a spy network with slaves and prostitutes who were also privy to personal details of their owners and customers. At the same time, she was training as a Voodoo priestess in Congo Square. Marie eventually revealed her identity as a Voodoo Queen and offered her services as a fortune teller. Because she’d gathered intimate information on the community her fortunes were uncannily accurate and she became one of the most influential figures in Louisiana. When Marie Laveau died in 1881 she was elevated to loa almost immediately, her spirit is the Great Mademoiselle Marie Laveau, the patron spirit of the city and the practitioners. Towards the end of the walking tour we talk about real Voodoo dolls, gris gris bags and potions. As if to prove a point James finds a $10 bill lying on the pavement. “This is Voodoo magic at work,” he laughs holding up his gris gris bag, a good luck charm he made to attract money. It contains bay leaves which symbolises money, lodestone, a natural magnet and a few strands of James’ hair. Money Voodoo spells is something we’re all interested in! The Voodoo Tour New Orleans moving through the streets of the French Quarter. 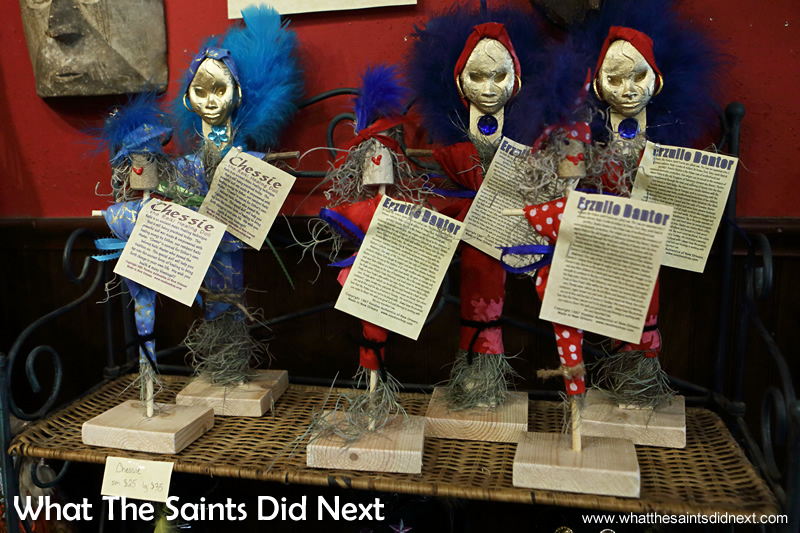 Louisiana Voodoo dolls of all types can be bought in The French Quarter. 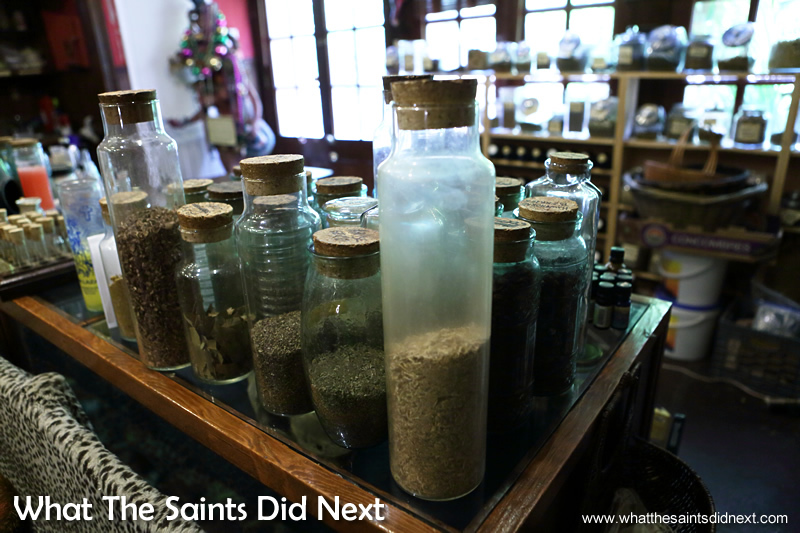 Potion ingredients for Voodoo magic waiting to be mixed inside Voodoo Authentica a ‘real’ Voodoo shop in New Orleans. 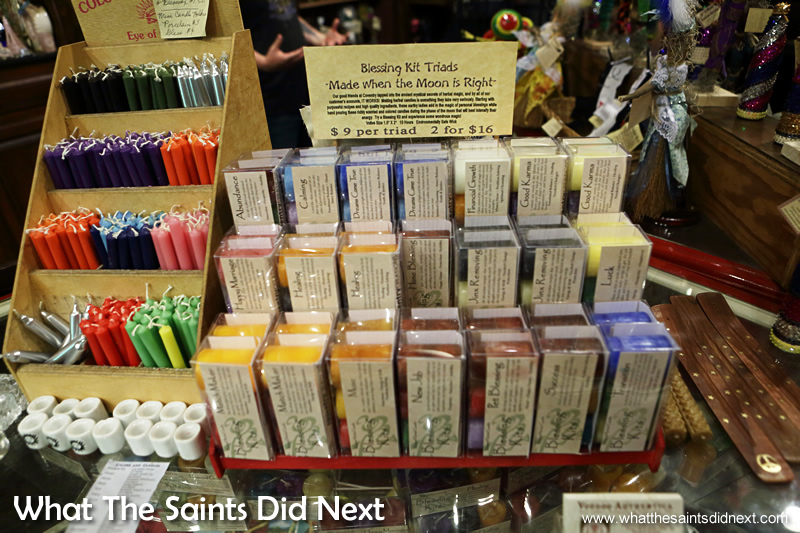 Blessing kit Triads and Voodoo candles for sale inside Voodoo Authentica, a’real’ Voodoo store New Orleans. Erzulie Freda altar honours Haitian Voodoo Loa (Voodoo Spirit Force) Erzulie who rules over love, romance, attraction and prosperity. Potions are similarly made, drinking them supposedly works instantly. They’re used to bestow prosperity, protection, healing, and most popular are Voodoo love spells. We all agree Voodoo dolls are synonymous with Voodoo black magic, they also go in hand with the belief that pins stabbed into one inflicts pain onto some unfortunate enemy. “That’s not true,” we’re flatly told. Dolls are not used to cast a Voodoo curse. They are are used for two reasons. One, they are representative of particular spirits for their influence ie love and guidance. Secondly, and this where people trip up, they are used for spiritual healing. Pin stabbing a Voodoo doll represents the particular spot on the body that needs to be healed and directs the lwa to that area. We’re then invited into ‘Voodoo Authentica,’ a ‘real’ Voodoo store and temple run by modern day practitioners. It’s small inside, filled with curios and altars honouring loas. There are spell formulas, potions, Voodoo candles, amulets and real Voodoo dolls for sale. A cordoned off area is a laboratory of sorts surrounded by jars of herbs and oils where love potions and gris gris bags are made. It’s fascinating just reading labels stuck on some of the items. I’d say James’ mission has been accomplished, with me at least; my ignorant view of Voodoo has been eradicated. I now have a better understanding and respect for a primitive religion brought unwillingly to these shores 300 years ago. It was humbling and enlightening to learn about the origins and history of New Orleans Voodoo. Free Tours By Foot offer a range of tours – for free. Well it says ‘free’ but its left to your discretion how much you’d like or are able to pay. A very good concept. They are well organised, an email was received the day before with details and the name and a photo of our tour guide. Whatever, you decide to pay will be well worth it. 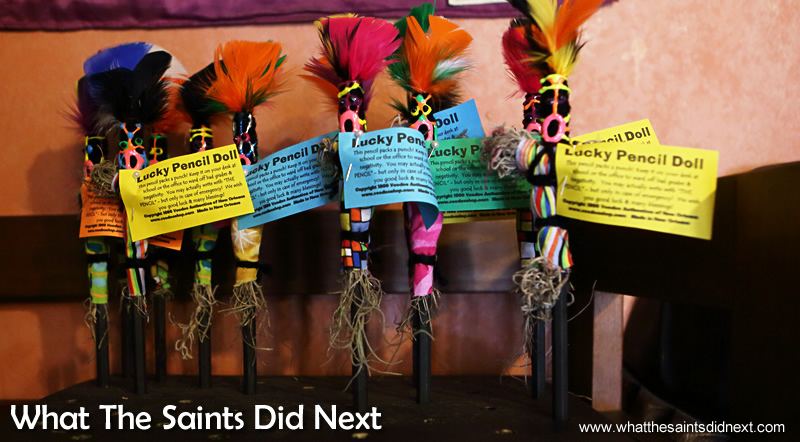 Authentic Voodoo dolls offer specific influences from different loas (spirits) ie love, prosperity or protection. 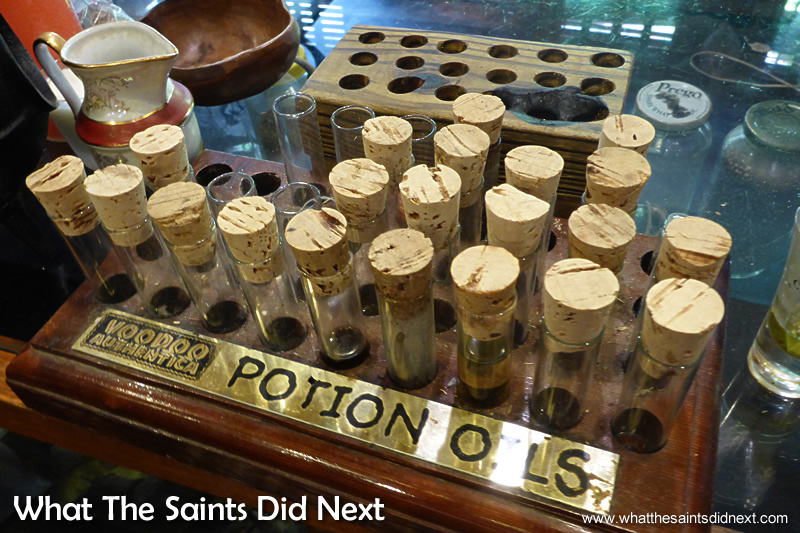 Voodoo potion oils inside the Voodoo Authentica shop. 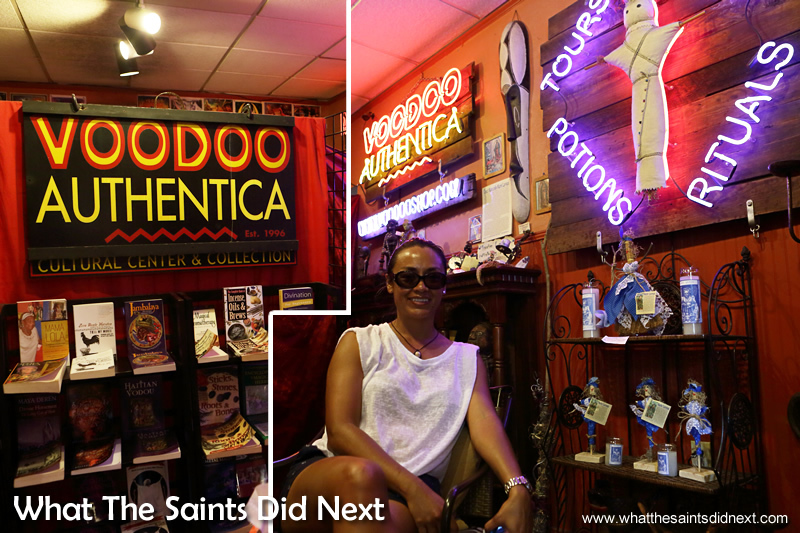 New Orleans Voodoo Museum and shop, ‘Voodoo Authentica’ where the tour ended. 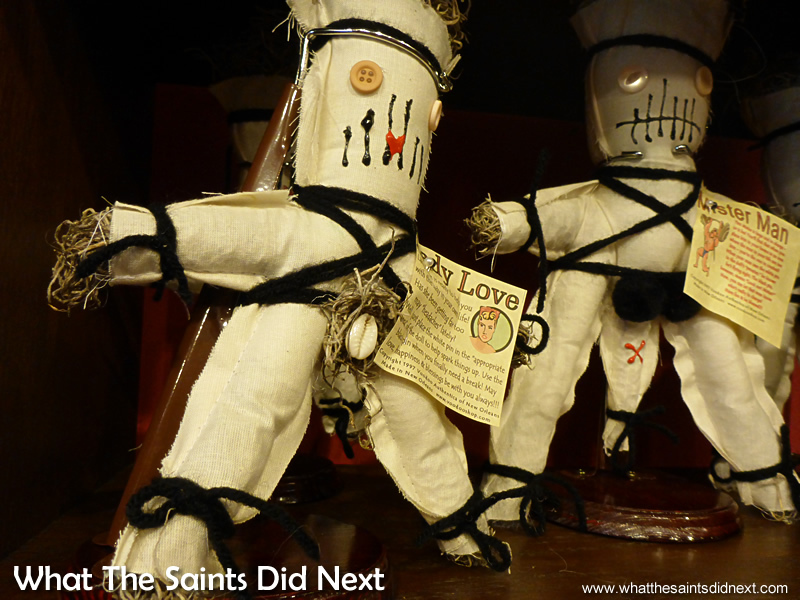 Lucky pencil Voodoo dolls New Orleans. 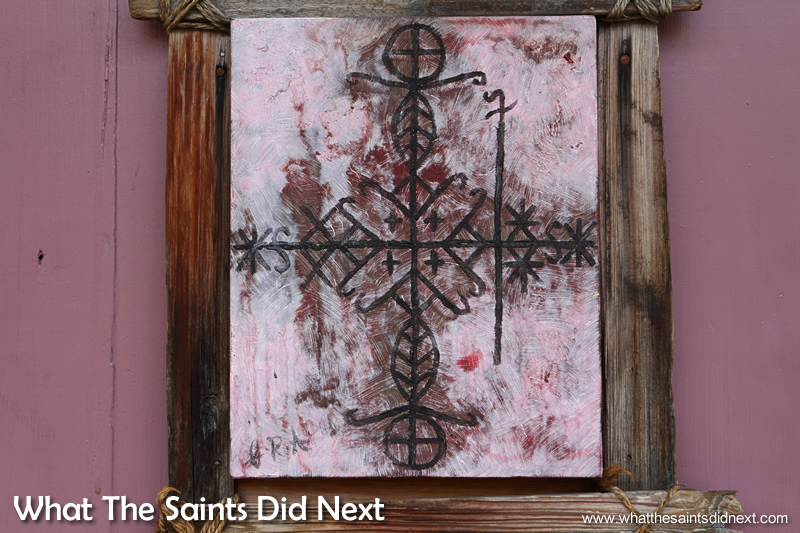 Veve Voodoo symbol design on the entranceway to Voodoo Authentica, the best Voodoo shop in New Orleans. 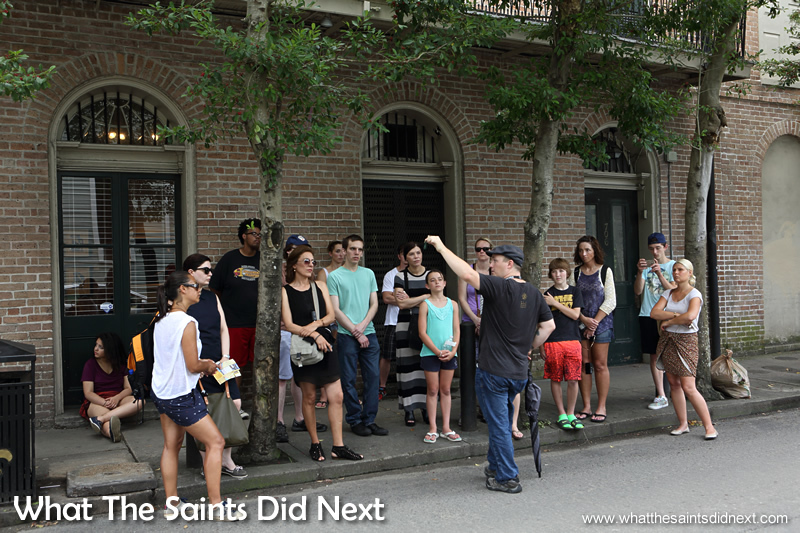 At the end of the best Voodoo tour New Orleans with our guide James McWilliams.